For all of us travelers out there, we all know how to book flights and hotels but often when we arrive we struggle to determine the how and where all of the best destinations to see are. Of course, each city will have tour groups you can join but it can be hard to find and many times you end up with bad guides or in the worst-case scenario it could be a scam. Thankfully a new/up and coming company called Klook has come to the rescue. 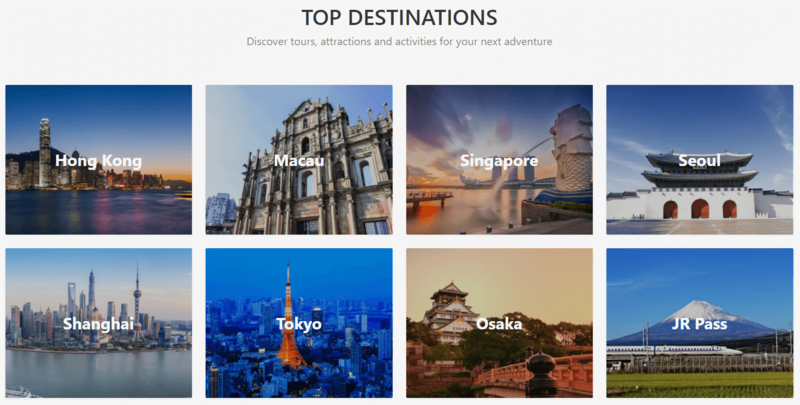 Klook is one of the first global companies to helps travelers to get setup with tours in most of the major cities around the world. With the Klook Affiliate Program you can refer your website viewers to certain attractions and earn a percentage of the profits! Click here to check out the different tours on Klook. 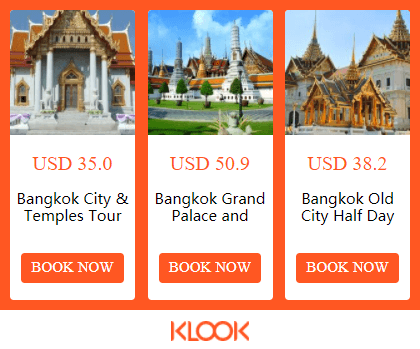 Klook specializes in many types of travel tours including city tours, night life attractions, shows and local attractions, popular tour destinations (in and outside of cities), car transportation, and SIM card/load orders for many countries. The way the Klook site is setup, they give you all of the specifics of the tour prior to purchasing the trip which is different than many other travel tour packages. They also provide the relevant itinerary and photos along with it to get you excited! They really help the customers to know exactly what they’re getting and make it as easy as possible to schedule in advance, removing the hassle of doing it when you get there. It’s by far one of the easiest products to sell online because it gets your viewers excited about their destination when they have a booked ticket to all of their favorite attractions. Klook offers a range of commission rates based on the different categories of the attraction ranging from 2-5%. While this is the default commission, Klook also has different commission rates for special activities which is specified in the affiliate tool. Bonus IncentivesYou can see all of the commission rates in the tool under the “Help – Commission Rates” section once you have signed up for the program. As an added perk, when you become a high-seller with the Klook Affiliate program you will start to earn more as they offer bonus commission once you achieve $5,000 USD in sales for a month. The bonus commission can really bring you in a lot of cash, but it does take a lot of work to get up to the minimum $5,000 requirement monthly. Once you hit the bonus commission mark, you will get an additional 6% commission on top of your original commission. There are also higher ranges of commission going up as high as 15% additional commission based on how much in sales you make per month. The great thing about travel tour programs is that there aren’t very many companies out there offering these (with an associated affiliate program). This means that the market for it is not very saturated so starting early with them is very beneficial! Viator: This company operates very similar to Klook and offers the same type of compensation program with approximately 5% commission. This is a good service to use as well if you want a partner company to Klook. Trip Advisor: Trip advisor may be one of the largest companies out there for travel currently, but I felt it lacked the personalized touch that Klook did. On the positive side, they do offer commission just for driving traffic even if it does not lead to a sale. Klook is a great pair for your website related to city guides, travel blogs, family trip planning, and even for promoting staycations. You can’t imagine how many times I’ve gone to a new city and the locals say to me “I haven’t even visited that place yet.” Traveling is really a fun thing to promote and luckily Klook makes it easy to do. You can go the general travel niche, as so many people do, or you can pick a more specific niche. Things like traveling in a specific country, or traveling with a specific goal in mind are great ideas to start with. Travelers going to China will have different needs as readers than travelers going to Ireland. Someone traveling alone with a rucksack will have different expectations from content than someone traveling with a family of five. Alternatively, you could choose to focus on products. Luxury luggage, travel gadgets/electronics, and travel anxiety relive are different website ideas in the broader scope of “travel” that I've considered building before. You can also utilize this on Facebook and Instagram when you travel. Whether you personally went on the trip through Klook trip or not, you can still share your experience with your friends on social media and and at the same time by using your affiliate link it's a great way to make some money on the side. I have a friend who has been using Klook for the past 2 years on his Instagram account and he’s been earning a lot just using Instagram alone. Can You Make Money With The Klook Affiliate Program? Text Links: Text links allow you to create specific hyperlinks to a city or activity in Klook. The link will include your partner ID # so that any booking that happens will be credited to you as the origin. As example, my partner ID is 2319 so that is how I receive the credit based on the link. You can simple change the partner ID # to your own and your account will then get credit. Power Ads: The Power Ads are great for either horizontal or vertical column generic ads that you can put on your footer or sidebar to attract traffic to Klook. These are customizable in both the size and the photo background used and are one of my favorites to use on my site. Activity Power Ads: The difference between Power ads, and Activity Power Ads, is that these have specific activities. This is a great way to advertise specific places you have been and can write about. Having the activity ad as a compliment to your story about a place is a great way to link your viewers to a potential Klook purchase. Search Box: This can be either a horizontal or vertical search box in which visitors can type a location, activity, or city in and it will take them right to the Klook site for the closest related activity. All of these ads if created under your login in the Klook Affiliate Tool will give you credit for any sales created from those links. While I know I have said many great things about Klook throughout this review, it really is an amazing program and there is very little negative about it. I think the only thing lacking currently in the tool is the lack of activities in most western/European countries. Klook is highly focused in Asia which is great if you’re traveling in that region, but it is limited elsewhere. Over time Klook is committed to continuing to expand it to additional places. Other than that, Klook is an amazing affiliate tool to use! As a final piece of information on the Klook Affiliate Program, I wanted to make sure you know that tracking of your ad performance in Klook is really simple and easy to use. You can see from the photo below a simple text link I created will have all of the impressions, click through information, and sales completed. They made it really easy for you to see which type of ad does great and which ones maybe you should think about changing. Have fun using the Klook program for all of your travel blogs and social media sites, and let me know if you know of any other amazing travel affiliate programs that we can review. Keep traveling always!